Where Roots And Wings Entwine: Jacamo wish list. As Lee very rarely gets any new clothes or shoes, wearing his existing clothes till they are completely worn, his wardrobe is looking rather old, tired and worn out. With a summer filled with family days out and holidays to visit family to look forward to he has been a little downhearted about having such a drab wardrobe and that he will not be looking his best especially when seeing loved ones thanks to his aged clothes. But as he hates to treat himself, preferring to treat the kids and get them new clothes or use spare money for extra days out, he will just make do and not even consider getting anything new for himself. As I hate that his old clothes make him feel blue, less confident and want him to feel good about how he looks especially when visiting his family who he rarely get to see (it has been a year this time since he last saw any of them in person), I have been shopping online to get him some new clothes to breathe some life back into his wardrobe. For hassle-free shopping for menswear and plenty of choice I visited Jacamo.co.uk to treat Lee to some new clothing. With lots of lovely items of clothing especially affordable mens shirts and staple-wardrobe trousers, there are lots of items from Jacamo that are top of a wish list of clothes for Lee. 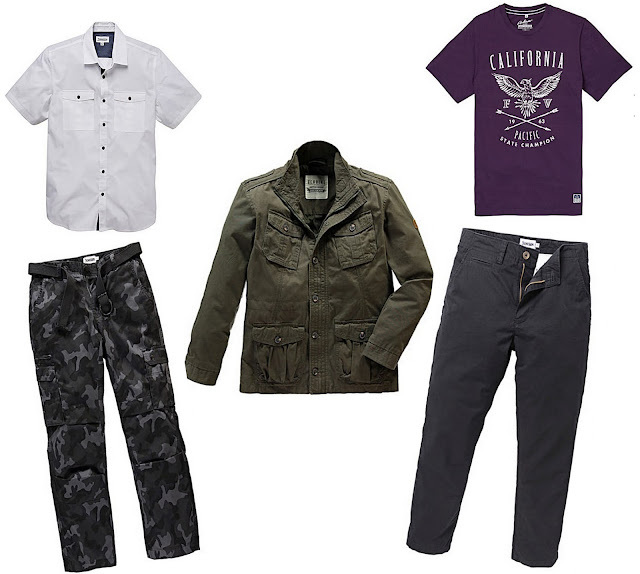 Above is just a few of our favourites especially the Carson cargo pants from the Jacamo range of clothing that he can look stylish in for both formal and casual looks. At least now thanks to Jacamo he will have some nice new clothes to wear when we visit loved ones and have lots of fun and adventures together as a family this summer.